Peptide CDGHQQGYAPKWRAEDAPL, corresponding to amino acid residues 853-871 of rat TRPV4 (Accession Q9ERZ8). Intracellular, C-terminus. Homology Mouse - 17/19 amino acid residues identical; human - 16/19 amino acid residues identical. 1. Anti-TRPV4 Antibody (#ACC-034), (1:200). 2. Anti-TRPV4 Antibody, preincubated with the control peptide antigen. 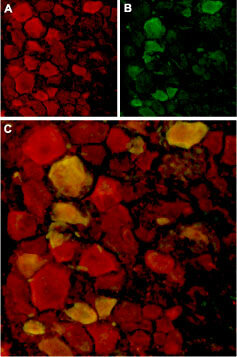 Rat and mouse brain lysates (10 μg Ab/0.500 mg whole-protein) (Benfenati, V. et al. (2011) Proc. Natl. Acad. Sci. U.S.A. 108, 2563). Immunohistochemical staining of rat dorsal root ganglion (DRG) frozen sections using Anti-TRPV4 Antibody (#ACC-034). A. TRPV4 (red) in DRG neurons. B. Staining with mouse anti-Parvalbumin (green) in the same DRG section. 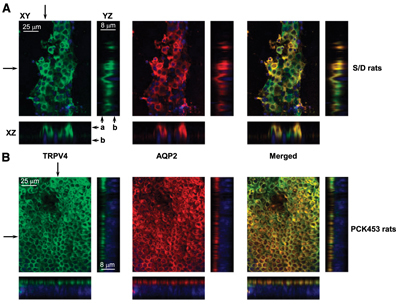 C. Confocal merge of TRPV4 and Parvalbumin demonstrates colocalization. Immunocytochemical staining of paraformaldehyde-fixed and permeabilized rat dorsal root ganglion (DRG) primary culture. A, D. Staining using Anti-TRPV4 Antibody (#ACC-034), (1:500), followed by goat anti-rabbit-AlexaFluor-555 secondary antibody. 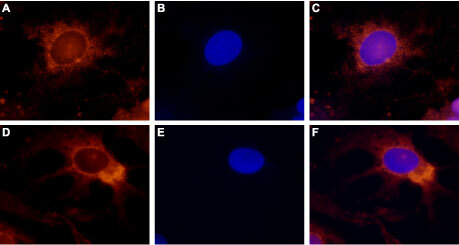 B, E. Nuclear staining of cells using the cell-permeable dye Hoechst 33342. C. Merged image of panels A and B.
F. Merged image of panels D and E.
Human corneal epithelial cells (HCEC) (1:200) (Pan, Z. et al. (2008) Cell Calcium 44, 374.). Montell, C. et al. (2002) Mol. Cell. 9, 229. Moran, M.M. et al. (2004) Curr.Opin.Neurobiol. 14, 362. Gunthorpe, M.J.et al. (2002) Trends. Pharmacol. Sci. 23, 183. Peng, J.B. et al. (2003) J. Physiol. 551.3, 729. Knockout validation of Anti-TRPV4 Antibody in mouse kidney.Immunohistochemical staining of mouse kidney sections using Anti-TRPV4 Antibody (#ACC-034) and Anti-Aquaporin 2-ATTO-550 Antibody (#AQP-002-AO). TRPV4 staining (green, upper panels) is detected in both the connecting tubules (CNT) and the collecting ducts (CCD). 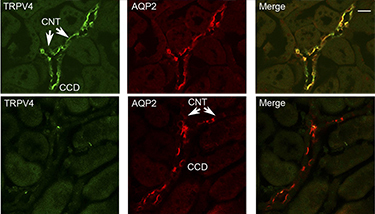 AQP2 immunostaining (red) is also observed in the CCD and CNT. TRPV4 staining is not observed in the sections from TRPV4-/- mice. Adapted from Berrout, J. et al. (2012) J. Biol. Chem. 287, 8782. with permission of American Society for Biochemistry and Molecular Biology. Anti-TRPV4 Antibody (#ACC-034) is a highly specific antibody directed against an epitope of the rat protein. The antibody can be used in western blot, immunoprecipitation, indirect flow cytometry, immunohistochemistry, and immunocytochemistry applications. It has been designed to recognize TRPV4 from human, rat, and mouse samples. Expression of TRPV4 in rat perihematomal area following ICH. Immunohistochemical staining of rat brain sections 24 hours after intracerebral hemorrhage (ICH) induction using Anti-TRPV4 Antibody (#ACC-034). At 24 hours post-ICH, TRPV4 immunostaining (red) was detected on neurovascular structures, perivascular astrocytes and endothelial cells in the perihematomal area. TRPV4 staining coincided with that of GFAP (lower panels), an astrocyte marker and von Willebrand factor (vWF) (upper panels), a marker of BBB. Nuclei were stained using DAPI. Adapted from Zhao, H. et al. (2018) Front. Mol. Neurosci. 11, 97. with permission of Frontiers. Immuno-colocalization of TRPV4 and KCa3.1 in human BSM cells. Immunocytochemical staining of human bronchial smooth muscle (HBSM) cells using Mouse Anti-KCNN4 (KCa3.1, SK4) (extracellular) Antibody (#ALM-051), (green) and Anti-TRPV4 Antibody (#ACC-034), (red). Adapted from Yu, Z. et al. (2017) Front. Pharmacol. 8, 559. with permission of Frontiers. 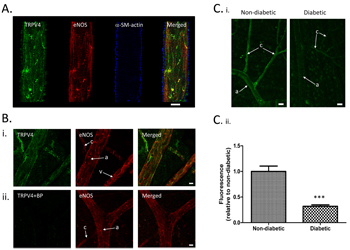 Downregulation of TRPV4 in rat retinal microvascular endothelium. Immunohistochemical staining of rat retinal sections using Anti-TRPV4 Antibody (#ACC-034). A. TRPV4 expression (green) is mostly detected in the endothelium of retinal microvessels. B. Specificity of the antibody is depicted by showing loss of TRPV4 staining when pre-incubating with the control peptide antigen. C. Significant decrease in TRPV4 expression is observed in retina section from diabetic animals. Adapted from Monaghan, K. et al. (2015) with kind permission of Curtis, T.M., Centre for Experimental Medicine, Queen’s University of Belfast. Immuno-colocalization of Aquaporin 2 and TRPV4 in rat kidney. Immunohistochemical staining of rat kidney sections using Anti-TRPV4 Antibody (#ACC-034) and Anti-Aquaporin 2-ATTO-550 Antibody (AQP-002-AO). Shown are Representative confocal plane micrographs (axes are shown) and corresponding cross-sections (pointed by arrows) showing three-dimensional stacks of TRPV4 (green), AQP2 localization (red), and the combined image localization (yellow). A. Wild-type Sprague-Dawley (S/D) rat. B. Cyst monolayer from a PCK453 rat. DAPI staining is shown in blue. Adapted from Zaika, O. et al. (2013) J. Am. Soc. Nephrol. 24, 604. with permission of the American Society of Nephrology. PKA activation causes TRPV4 subcellular translocation. Immunocytochemical staining of TRPV4 expression in split-opened nephrons using Anti-TRPV4 Antibody (#ACC-034). A. control conditions. B. Activation of PKA with forskolin leads to TRPV4 translocation to the apical plasma membrane. C. Activation of PKC with PMA has no effect. D. pre-treatment with PKA specific inhibitor, abolishes TRPV4 translocation. Adapted from Mamenko, M. et al. (2013) with permission of American Society for Biochemistry and Molecular Biology. Immunohistochemical staining of mouse kidney sections. Also tested in TRPV4-/- mice. Berrout, J. et al. (2012) J. Biol. Chem. 287, 8782. Suresh, K. et al. (2018) Am. J. Physiol. 314, L893. Dong, Q. et al. (2017) Sci. Rep. 7, 42678. Rat cerebral arterial myocyte lysates. Gebremedhin, D. et al. (2017) PLoS ONE 12, e0176796. Rat neonatal ventricle myocyte lysates. Wu, Q.F. et al. (2017) Cell Death Dis. 8, e2828. Kim, S. et al. (2016) Sci. Signal. 9, Ra71. Mouse bone marrow-derived macrophage lysate. Scheraga, R.G. et al. (2016) J. Immunol. 196, 428. Human microvascular endothelial cell (HMEC-1) lysate (1:2000). Goedicke-Fritz, S. et al. (2015) Eur. J. Cell Biol. 94, 391. Mouse microvascular endothelial cell lysate (1:500). Suresh, K. et al. (2015) Am. J. Physiol. 309, L1467. Rat myometrial protein lysate (1:200). Ying, L. et al. (2015) Sci. Transl. Med. 7, 319ra204. Castellani, L. et al. (2014) J. Appl. Physiol. 116, 1272. Che, H. et al. (2014) Pflugers Arch. 466, 947. Parker, J.C. et al. (2013) Physiol. Rep. 1, e00121. Rat and mouse brain lysates (10 µg/500 mg lysate). Benfenati, V. et al. (2011) Proc. Natl. Acad. Sci. U.S.A. 108, 2563. Zhao, H. et al. (2018) Front. Mol. Neurosci. 11, 97. Rat cerebral arterial segment sections. Okada, Y. et al. (2016) PLoS ONE 11, e0167200. Meng, Q. et al. (2015) Am. J. Physiol. 309, C1. Monaghan, K. et al. (2015) PLoS ONE 10, e0128359. Zaika, O. et al. (2013) J. Am. Soc. Nephrol. 24, 604. Mouse kidney sections. Also tested in TRPV4-/- mice. Human bronchial smooth muscle cells. Yu, Z. et al. (2017) Front. Pharmacol. 8, 559. Rat myometrial smooth muscle cells (1:200). Rat pulmonary microvascular endothelial cells (RPMVEC) (1:200). Mamenko, M. et al. (2013) J. Biol. Chem. 288, 20306. Human corneal epithelial cells (HCEC) (1:200). Pan, Z. et al. (2008) Cell Calcium 44, 374. Wen, L. et al. (2018) BMC Ophthalmology 18, 38. Jo, A.O. et al. (2016) Proc. Natl. Acad. Sci. U.S.A. 113, 3885. Alexander, R. et al. (2013) Br. J. Pharmacol. 168, 761. Fawcett, K.A. et al. (2012) J. Neurol. Neurosurg. Psychiatry 83, 1204. Ye, L. et al. (2012) Cell 151, 96. Anti-TRPV4 (extracellular) Antibody (#ACC-124). This antibody recognizes a different epitope and thus can also be used as a control for detecting TRPV4. Anti-TRPV4-ATTO-550 Antibody (#ACC-034-AO). A fluorescent labeled primary antibody. It can be used in immuno-colocalization studies in conjunction with any of our antibodies raised in rabbit. Anti-TRPV4 (extracellular) Antibody (#ACC-124). This antibody recognizes an extracellular epitope and can be used to detect TRPV4 in live cells.